I used to think grasshoppers were cute. Now I totally despise them. Snails too. The last 2 Springs have been an all out battle. Last year I had to plant my basil 3 times. As you know, I love growing basil and making pesto all summer long-see my Pesto Recipe blog post. This year I have planted them twice so far. I have an herb garden in our courtyard and the last 2 Springs the grasshoppers have gone crazy eating everything in their path. The snails have done their fair share too. They like to eat my basil, mint and lemon balm. Even my fig and lemon trees! I have resorted to planting some basil and mint in pots on the back porch. Seems to do better there. I am trying to be all organic and it is hard. The organic insect sprays do not seem to work much. I asked for ideas on facebook and my friends have told me to use beer for the snails. At night I put beer in little plastic tubs, the snails love it and drown! Then for the grasshoppers I have found that Diatomaceous Earth works best. It is a really soft sedimentary rock (contains fossilized remains of marine phytoplankton) that easily turns into powder. It kills bugs that have an exoskeleton, but is not harmful to mammals (some people even eat it for detoxing-not trying that yet). 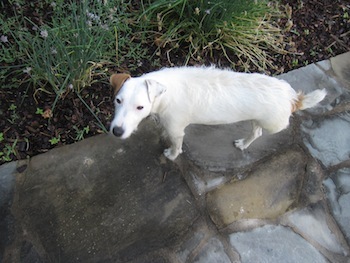 I have another secret weapon-my 3 legged Jack Russell Terrier named Bella. It has become a game with her to catch and eat the grasshoppers. So about 3 times a day we are going outside and playing the grasshopper game. It’s really working! I hope they are good protein for Bella! Any other garden ideas are welcome here!